The Rwenzururu Kingdom, located in the Rwenzori Mountain Region of the South Western part of Uganda spans into the Democratic Republic of Congo among the Bakonzo / Banande, Bamba and Basumba people who dwell in the mountain region. A Banya Rwenzururu (The people of Rwenzururu) The term Banyarwenzururu refers to the people of Rwenzururu (Rwenzori Mountains). Banyarwenzururu also means the mountain covered with snow, which was mistakenly re-named by explorer H.M, Stanely as Ruwenzori – the Mountains of the Moon. The Rwenzururu Kingdom is a monarchy of the inhabitants of and people descending from the Rwenzori Mountains. The Bakonzo/Banande, Bamba and Basumba are ethnic groups that originally lived and still live on and around the Rwenzururu Mountains. Currently, the Bakonzo alone are about 6,000,000 people with an estimated 1,000,000 on the Ugandan side of the Mountain and 5,000,000 on the Democratic Republic of Congo side and are more commonly known as Banande. Both the Bakonzo and Banande belong to the Bayira community, a Bantu speaking people. On the Ugandan side the Bakonzo occupy the Rwenzururu Mountains cut across the District of Kasese, Kabarole and Bundibugyo. Those in Congo are found in North Kivu province with Butembo and Beni as their major towns. The Bamba who are sub-divided into Babwisi, Babutoku, Vonoma and Babila predominantly occupy the plains of Bundibugyo district. The Basumba are divided and scattered in the plains of Bundibugyo district. They move to and fro in the Semliki valley of Bundibugyo district. Like any other group of people around the world living on mountains, the Bakonzo, Bamba and Basumba are courageous, industrious, self-reliant and hospitable. As a hospitable society, the Bakonzo, Bamba and Basumba hosted and gave sanctuary to people of other ethnic groups who used to be persecuted by the ancient Kings of Bunyoro such as Kamurasi, Kyebambe, and Kabalega. Such groups were the Batooro, Batuku, Banyabindi, Basongora and Banyagwaki. The Bakonzo bear themselves with great dignity, are conscientious about education and that wonderful core spirit of conservative African values and modest manners. They are relaxed yet hard working and very sociable, caring, respectful, loving, loyal, trusting and trustworthy. There are a number of theories as to the history of the first Bakonzo but here you will read of the two most common. The Bakonzo claim to have been the first people to settle on Rwenzururu Mountains and believe to have been created by God just as Adam and Eve in Eden. Legend on the other hand has it that the Bakonzo once lived on Mount Elgon in Eastern Uganda and that during the Kintu migration, the Bakonzo came with Kintu and other peoples to Buganda and later migrated further to the western highlands of Mount Rwenzori which has a climate similar to that of Mount Elgon where they had originally lived. This is said to have been around A.D 1300. The Initiation The Bakonzo share some elements of culture with the Bamba, one such element was the initiation. The purpose of initiation was to transform the initiates from childhood to adulthood. Therefore all the male children, before or after reaching puberty, had to undergo circumcision. This was conducted jointly by the Bakonzo and the Bamba. The ceremony would normally begin in Bwamba and then end in Bukonzo. The initiation ceremony was conducted after long intervals, often fifteen to seventeen years. It involved all male children from the age of three years. The Economy The Bakonzo are agriculturalists. They grow mainly casava, yams, matoke, potatoes and beans. At a later time, they took up coffee and cotton growing. In addition, they reared goats, short-horned cows, sheep and fowls. Their short-horned cows were looted by Kabalega’s warriors from Bunyoro-kitara, and the rest died of cattle diseases brought by the long-horned cows of the pastoralists of the Bachwezi descent. Production was initially subsistence and they supplemented their produce by hunting and fishing on Lakes Edward and George. The History of Rwenzururu Kingdom The historical account dates back to the 18th century. This was the time Bunyoro Kitara was a very strong empire attacking any territory in order annex more territory. Rwenzururu Mountains was one of the areas that were attacked several times. The Rwenzururu clan leaders kept on defending their subjects against Bunyoro Kitara expeditions. The BanyaRwenzururu at this time were not ruled by one human being, they were just divided into clans. No one of the clan leaders could dare to subjugate fellow clan leaders because they considered themselves as one family of Kithasamba and descendants of Creator God – Nyamuhanga, who hated blood shade of innocent people. Therefore, the role of the clan leaders was to defend innocent people, men, women and children against the attackers. 1820-70 Ruhandika, Kalikura, Busongera Bwa Ntule, Ghome-Ghome, Rubiha,Kakuri, Kithengera, ruled under Kithasamba, who engaged in fighting against Bunyoro Kitara and the slave traders. 1830 Prince Kaboyo of Bunyoro rebelled against his father Kyebambe Nyamutukura of Bunyoro Kitara and fought against his brother Nyabwongo the Saza Chief of Mwenge. Kaboyo Hides in Kangele’s Chiefdom of Burahya being assisted by King Ruhandika. 1830-1860 Kisoro Kya Ghome-Ghome guarded the Rwenzururu mountains against the expeditions of Banyoro and Arab slave traders. 1840 1840 The Bunyoro Kitara fighters called Baruusura camped at Ibonde and threw several Konzo rulers in Lake Kaitabarogo which was nicknamed Toro (a place of escape). 1870- 99 Omukama Chwa Kabarega of Bunyoro attacked the Batoro, Bamba and Bakonzo in search of Kasagama who was taking refuge in the Rwenzururu Mountains guarded with Ruhanda and Kengele’s worriers. The Bakonzo gave refuge to Prince Kasagama and took him to Buganda through Ankore where he met with the British Captain Lord Lugard of the Imperial British East African Company. 1889 – Explorer H.M. Stanley arrives at a snow capped huge mountain locally known as Rwenzururu by the mountain dwellers, Rwenjura by some of those staying on the low land, and Bugombowa (Bugombwa) by the forest people. Some mountain dwellers also called it Viruka (Birunga, or Biruka), Aviruka (Ebiruka). Explorer Stanley Nick-names the mountain “Ruwenzori” by combining the words Rwenzururu and Rwenjura together. H. M. Stanley mentions a King of the Bakonzo by the name of Ruhandika. 1890 Captain Lord Lugard brought back Kasagama. Kasagama declared himself ruler over the land stretching from Lake Kakule (Katwe) and beyond the Mountains. 1893 Once again Kasagama runs a way from the Baruusurwa bo Mukama wa Bunyoro in search of a hiding place. King Ruhandika hides him at Kisyenene’s home in Kaghughu. Ruhandika defeated the Banyoro at Mandaku. 1894 The British colonial government created the Kingdom of Toro to guard themselves against Kabalega of Bunyoro. The Angolo-Belgian Agreement marked the divide and rule boundary separating the Bakonzo (Banande) and Bamba (Batalinge) in Belgian Congo and British Uganda. 1900 On June 26 1900: The British Colonists, for easier administration, forced the Bakonzo who lived on the Slopes of Mount Rwenzori, and the Bamba to become part of Tooro Kingdom. 1902 Kasagama tries to use force in collecting hut tax from the Bamba and resisted with blood shade because they did not recognize him as a ruler over their territory. They continued paying tax to the colonial government but not to Toro Kingdom. 1918 Nyamutswa began a liberation movement against Toro Kingdom and the colonial rule in search of re-establishing the Kingdom under Kithasamba and thereby have a separate district from Toro. The colonial government used to establish a district in each Kingdom. They did this in Ankole, Bunyoro and Buganda. Nyamutswa wanted the same thing to happen for his people on the Rwenzururu Mountains. 1919 Nyamutswa was joined by Tibamwenda and Kapolya in the struggle to liberate their people from Toro Kingdom and the colonial suppression of their traditional institutions and land. Nyamutswa (Muhira by clan) was crowned a King at Kanyatsi in Kisiinga sub-county with another palace at Ndalibanwa in Kasithu, Bughendera, county. 1921 Nyamutswa, Tibamwenda and Kapolya were executed by the Imperial British East African Company (IBEAC) in collaboration with Ngoma Njumgu – Tooro Kingdom leadership with headquarters and buried them in one grave at Kagando, Kisinga. IBEAC had its headquarters in Nairobi. The Bakonzo and Bamba retreated for re-organization and the Batoro took their land, levied heavy tax on them, put them under forced labour (olubwa), treated them with disdain and arrogance. The Bakonzo and Bamba were denied development in terms of schools, clinics, roads, markets and use of their language. The British gazetted their farmland and forests (hunting ground) as game reserve. 1924 Bwamba was totally made the responsibility of Toro Kingdom. 1926 Bwamba is finally made part of Toro by the British Colonialists. 1938 The Bamba were finally forced to pay tax to Toro local government. They referred Toro as the land of slavery (e Bukobe) up to the present. 1954 Isaya Mukirania began a Bakonzo Life History Research Society. He was accompanied by Mr. Tom Stacey a Book Writer from UK. The Bakonzo and Bamba begin demanding for independence from Tooro Kingdom and the Colonial Government. They call it Rwenzururu Bakonzo-Bamba with a word Tulibaghuma as a motto. And a spear headed the word akethu-kathere (we lost our land, our treasure). 1962. The Bakonzo and Bamba declared a separate Kingdom of Rwenzururu from Toro, on 30th June. Mr. Muhindo Murahya raised the first Flag and put the announcement over the Colonial Radio in Uganda. Government appoints a Commission led by Sembeguya into the situation in Bwamba and Busongora. They submit their report to the Governor on 10th October, 1962. 1963 At Buhumbania, Isaya Mukirania was declared King of the Rwenzururu Kingdom by various heads of clans from around Mount Rwenzori on 30th June 1963. But not fully installed King for purposes of democracy and consultations. 1964 Toro Kingdom declares 14 days of Massacring the Bakonzo, a genocide that was never given its right name. Men, women, children and the unborn were slaughtered, hacked and burned alive. Houses were put on fire and property looted. After two weeks of mass slaughter Uganda government sends police to rescue the remaining and take them to Kahunge refugee camps. 1964 John Babiha, a Mutoro Vice President of Uganda announced to have the Bakonzo tribe extinct and declared the area a game reserve. Hon. Balinda greatly condemns the act of massive slaughter of the Bakonzo people and supports the idea of a separate district in Toro for Bakonzo and Bamba. A District that would have equal status with Toro, Buganda and Ankole. 1966 Isaya Mukirania died on 2nd September, 1966. Charles Mumbere is crowned Second King of Rwenzururu on 19th October, 1966. He is named Charles Wesley Mumbere Kibanzanga II under the guidance of Regent Minister Yohana Mwambalha and the Queen Mother, Christine Mukirania. Hon. Samwiri Mukirania remains Prime Minister till 1971 when he retired. The office remains vacant for one year until 13th March, 1972 when one of the King’s advisors Hon. Yolamu Mulima was appointed to become the second Prime Minister of Rwenzururu Kingdom. Omusinga Charles Wesley Kibanzanga II becomes Omusinga Charles Wesley Irema-Ngoma I. 1967 Apolo Milton Obote abolishes Kingdoms. The BanyaRwenzururu continue with their Kingdom in the Mountains and oppose government decision to abolish the rest of the Kingdoms. 1971 Idi Amin takes over power in a military coup on 25 January, 1971. Idi Amin Dada, Uganda’s new military head of state meets a delegation of Bamba/Bakonzo elders and creates on paper the new Rwenzururu District which he later announced as Rwenzori and Semuliki Districts on 5th May, 1971. 1972 Omusinga Charles Wesley Mumbere Irema-Ngoma now no longer minor, takes responsibility and appoints Hon. Yolamu Mulima as his Prime Minister. 1980 President Godfrey Lukongwa Binaisa of Uganda receives a delegation of Renzururu leaders and promises to recognize the Kingdom with others. President Binaisa changes the Name of Rwenzori District into Kasese District and Semliki into Bundibugyo District. 1982 August 15, Omusinga Charles Wesley Irema-Ngoma willingly descends from the Mountains and hands over his soldiers, arms and ammunitions to the government of Uganda in hope of working with the government of Uganda to restore Kingdoms including the Rwenzururu one. This was during the Second rule of Dr. Apolo Milton Obote. Omusinga Irema-Ngoma is given the title of Chief Elder of Kasese District by the Republic of Uganda. Government gives him a house, two shops, a bus, a lorry and a car to give him a beginning and settlement as a Chief Elder. 1986 The National Resistance Movement (NRM) takes power under President Museveni. Omusinga Irema-Ngoma’s special scholarship is unceremoniously discontinued. 1993 NRM Government Restores Kingdoms. Rwenzururu Kingdom is not restored. 1995 Hon. Ivan Walemba, Hon. Loice Bwambale and Hon. Kule Joseph Muranga during the constitutional assembly petition for the restoration of Rwenzururu Kingdom. The Bakonzo population supports them. Hon. Crispus Kiyonga and Hon. Mbura-Muhindo Jerome oppose the idea of the restoration of Rwenzururu Kingdom. 1997 A Fundamentalist Islamic group called the Allied Democratic Forces (ADF) groups in Congo, which was believed to have been supported by the Sudanese government, attacks Uganda through Mpondwe Kasese District in the Month of December. 1998 Anti-Rwenzururu Kingdom elders in Kasese accuse Omusinga Irema-Ngoma of being the ADF commander and declares him no longer a King. The District Chairman Mr. Bihande Yokasi Bwambale disassociates himself with the group of Elders and calls for the democratic procedures in solving the Rwenzururu question. The population supports Mr. Bihande for a justification of the accusation against the King. Many Bakonzo youth promise to join the ADF group if it was true that the King was its commander. The Vice-Chairman of the National Resistance Movement, Hon. Al-Hajj Musa Kigongo, and the National Political Commissar, Hon. James Wapakhabulo intervenes in the matter. Hon James Wapakhabulo visits Kitswamba, Kasese, and Kisiinga to check on the problem of the Bakonzo and their monarchy and reports back to parliament that the Bakonzo are in dare need to have their monarchy restored. Omusinga Irema-Ngoma arrives at Entebbe on 20th November as a state guest. Omusinga is recieved by a mammaoth crowd of drummers, dancers and enchanters from the Rwenzururu Mountains. Omusinga Irema-Ngoma meets President Museveni twice in the presence of government dignitaries, and the Minister of Health and Member of Parliament for Bukonzo West, Dr. Cripus Kiyonga, the Member of Parliament Women Representative for Kasese District and former Deputy Minister for Women in Development, Hon. Biira Loice Bwambale, Member of Parliament for Busongora South, Hon. Prince Christopher Mbalibulha Kibanzanga, Member of Parliament for Bukonzo East, Hon. Apolinaris Kithende Kalibogha and Member of Parliament for Busongrora North, Hon. Kule Joseph Muranga. Omusinga shows that he was not connected with the ADF rebels. He did not know their leadership neither did the ADF leadership know him. Omusinga visits Kasese, Kitswamba, Kisinga, Bwera and Bundibugyo towns of his Kingdom. Omusinga is given a royal welcome by his people. He assures them to have not been part of the ADF rebels and appeals to anyone who joined the movement in hope that he is fighting for Charles Mumbere Irema-Ngoma to surrender to government. Omusinga is given another title by Hon. Muruli Mukasa and Hon. Mulindwa Birimumaso, as Omusingania (the uniting factor). Omusinga is given a Diplomatic passport of the Government of Uganda. The Government agrees to resume a special scholarship for Omusinga Charles Wesley Mumbere Irema-Ngoma. The president promises to restore the Rwenzururu Kingdom after peace is restored in the Rwenzori region. Omusinga Irema-Ngoma returns back to the United States of America to resume studies on government scholarship. Omusinga takes with him his daughter Princess Joyce Furaha Biira. 1999 Omusinga appoints a research committee to look into the historical facts behind obusinga Bwa Rwenzururu that would also help in establishing a peaceful settlement to the Rwenzururu Question. The Committee was composed of Dr. Yona Balyage (coordinator), Dr. A. Muhindo-Syahuka, Mr. Yona Kibatsi, Rev. Balinandi and Mr. Nelson Ndungo. They find out that over 80% of the bakonzo were in favour of the restoration of Obusinga Bwa Rwenzururu and Omusinga Charles Wesley Mumbere as their King. Upon realizing that Omusinga was not part of the ADF saga, the Bakonzo youth ask President Yoweri Museveni through Hon. Kule Muranga Joseph who was Secretary to the Parliamentary Committee on Security and Internal Affairs, to give them ammunitions in order to fight side-by side with government forces to root out the ADF fighters from their territory. The Bakonzo faithfully did their part. 2000 President Yoweri Museveni appoints a Munyankole re-known researcher at Makerere University on ethnicity and conflict resolution, by the name Kabbann Kabananukye to research on the issue of Rwenzururu. His research found out that 85% of the Bakonzo were in favor of the restoration of Rwenzururu Kingdom. He also found out 85% of the supporters of obusing Bwa Rwenzururu also favour Omusinga Mumbere Irema-Ngoma as their King. A delegation of the supporters of Rwenzururu Kingdom is invited by President Yoweri K. Museveni in his Parliament building office under the leadership of Mr. Simon Mulongo, the Resident District Commissioner of Hoima on 8th March. They pointed out the Lacuna in the law of the government of Uganda which did not allow them to have their Kingdom restored just like other Kingdoms that have been restored and new ones that have been created. 2005 In January Omusinga and his officials visit President Yoweri Kaguta Museveni at his upcountry residence at Rwakitura in Mbarara District. The President appoints a Ministerial Commission to look into the issue surrounding of Rwenzururu Kingdom and its recognition. The Ministers appointed were Rt Hon. Henry Muganwa Kajura – Second Deputy Prime Minister and Minister of Minister of Public Service, Hon. Betty Akech – Minister of State for Security, Hon. Daudi Migereko – Minister of State for Energy, and Hon. Engineer John Nasasira – Minister of Works, Housing and Communication. During the visit of the Kajura commission it was observed that 90% of the Bakonzo in Kasese District support Obusinga, 100% of the Bakonzo in Bundibugyo do support Obusinga Bwa Rwenzururu and a good number of Bamba support the institution. The Report recommended the restoration of the OBusinga Bwa Rwenzururu with Charles Mumbere Irema-Ngoma as the King of the same. 2006 In July, based on the Kajura Commission report, President Museveni asks the Movement Cadres in the districts of Kasese and Bundibugyo to advise him on the direction he should take in the process of the restoration of Obusinga Bwa Rwenzururu. He appoints Retired Bishop Zebbedee Kahangwa Masereka to be chairman of the Committee of cadres. 2007 Dr. Crispus Walter Bazarrabusa Kiyonga, Minister of Defense, withdraws his opposition against Obusinga Bwa Rwenzururu, and asks his supporters to rally behind him in support of the wish of majority. 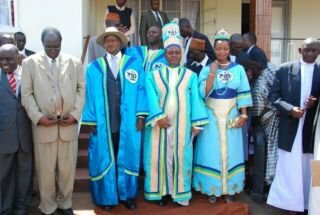 October 19, Omusinga Charles Irema-Ngoma celebrates the 41st Anniversary of his Coronation as Omusinga wa Rwenzururu, at Buhikira Royal Palace, in Kasese Town. A mammoth gathering of Bakonzo/Banande from Uganda and Congo, Bamba, Basumba, Banyoro, Banyankole, Bakiga and others attend the ceremony. In attendence were Mr. Tom Stacey from UK, visitors from USA, Dr. Kiza Besigye, President of the main opposition party in Uganda and Mrs. Miria Obote were among those who attended the ceremony. On October 20, Omusinga Charles Wesley Mumbere Irema-Ngoma weds Agnes Ithungu Asimawe. In the Cathredral of the Anglican Church of South Rwenzori Diocese. Bishop Nzerebende unites them in holy matrimony. Tens of thousands attend the ceremony including Dr. Crispus Kiyonga, Members of Parliament from Government and opposition sides, Mr. Tom Stacey, President of UPC Miria Obote, leader of opposition in parliament, Prof. Ogenga Latigo were among those who attended the function. A Special delegation from the Kabaka of Buganda is welcome at the reception at golf club. 2008 On Sunday March 9, Omusinga inaugurates the Obusinga Bwa Rwenzururu Recognition Council at Buhikira Royal Palace in Kasese Town. In March, Kasese District Council, under the leadership of the District Chairman Rev. Kithaghenda gives three hills of Nyakabingo Village in Kasese town Council to Omusinga Charles Wesley Mumbere Irema-Ngoma to build Buhikira Royal Palace and its related projects. On March 17, The Prime Minister of the Government of Uganda , Professor Apolo Nsibamba writes a letter to the Minster of Gender, Labour and Social Development Hon Syda Bbumba that Cabinet has recognized Obusinga Bwa Rwenzururu as a cultural institution under the leadership of Omusinga Charles Wesley Mumbere Irema-Ngoma, after studying a report of the Ministers led by the 2nd Deputy Prime Minister, Rt Hon Henry Muganwa Kajura. The Statement is announced by various mass media and BanyaRwenzururu express their confidence in the Government of Uganda under the leadership of President Yoweri Museveni. 1st April, Prime Minister Professor Apolo Nsibambi clarifies that he wrongly said that cabinet recognized Obusinga Bwa Rwenzururu but that the issue is on the cabinet agenda ready to be discussed. He instructs Minister Syda Bbumba to include other concerns of BanyaRwenzururu on the agenda to be discussed by cabinet. People however get upset with mixed feelings. April 23rd, Rt. Rev Henry Luke Orombi Archbishop of the Church of Uganda (Anglican) becomes the first National Religious Leader to visit the Royal Palace of Rwenzururu Kingdom at Buhikira in Kasese town. He was acompanied by the Bishop of South Rwenzori Diocese, The Rt. Rev. Bishop Jackson Thembo Nzerebende. He was recieved by the Executive Chairman of the Rwenzururu Kingdom Recognition Council , Mr Constatine Bwambale. Her Royal Highness Nyabaghole (Queen), Agnes Ithungu Asimawe with optimism on the Archbishop to add his voice to those of thousands of BanyaRwenzururu to emplore the government to recognize the Obusinga Bwa Rwenzururu which is long overdue. May 16, Omusinga Charles Irema-Ngoma through Mr Noah Nzaghale his Personal Private Secretary announces the launch of the Kingdom website. He points out that the website will link the Kingdom’s culture, aspirations, history and news to the BanyaRwenzururu and the rest of the world. 2009 June 3, Omusinga Charles Wesley Mumbere Irema-Ngoma appointed Mr. Constantine Bwambale to the office of Omulerembera (Prime Minister of Obusinga Bwa Rwenzururu). Rt. Hon.Constantine Bwambale is the fourth Prime Minister of Obusinga Bwa Rwenzururu since 1965, after Sir. Samuwri Mukirania, Yolamu Mulima, and Yeremiya Muhongya. 2009 August 30, the President of the Government of Uganda, General Yoweri Kaguta Museveni expressed his position to recognize Obusinga Bwa Rwenzururu. He announced this at St. Paul’s Cathedral of the South Rwenzori Diocese of the Anglican Church in Kasese Town. He also accepted Omusinga Irema-Ngoma’s invitation to attend the 43rd Coronation Ceremony of King Charles Mumbere to be held in Buhikira Royal Palace in Kasese town, on October 19, 2009. 2009 October 19, the President of the Government of Uganda General Yoweri Kaguta Museveni announced government’s recognition of Obusinga Bwa Rwenzururu, and congratulates the Rwenzururu King and all BanyaRwenzururu upon achieving this success. The President attends the 43rd Anniversary of the Coronation of King Charles Wesley Mumbere Irema-Ngoma. He witnesses the performance of Bakonzo traditional coronation rituals at Buhikira Royal Palace in Kasese Town and lays his hand on the coronated king, signifying his acceptance of the King on behalf of the Government and the people of Uganda. Both King Mumbere Irema-Ngoma and President Museveni address a mammoth crowd of about one million people at Kilembe Mines Golf Club in Kasese Town Council. President Museveni promises to donate a brand new car to the King and assistance towards the construction of the Palace. Among the Witnesses were the First Deputy Prime Minister of the Republic of Uganda, Rt. Hon. Eriya Kategaya, the Minister of Gender and Cultural Affairs, the Minister of Defence Dr. Chrispus Kiyonga, Tom Stacey, the FDC Leader Dr. Kizza Besigye, the Minister of Culture and Arts of the Democratic Republic Republic of Congo, Hon. Kambale and the DRC Ambassador to Uganda, among others.